One of the world’s foremost parenting experts offers a revolutionary guide for translating a crying baby’s urgent messages. Like many new parents, Priscilla Dunstan was at her wit’s end trying to ease the crying of her colicky infant son. Then she made a startling discovery: His sounds varied according to his needs, and she could decipher their meaning by tracking the sound as a physical reflex. Unlike learned languages, Dunstan soon realized, every newborn from birth to three months possesses a natural, reflexive communication system for signaling hunger, tiredness, the need to burp, lower gas, and general discomfort. 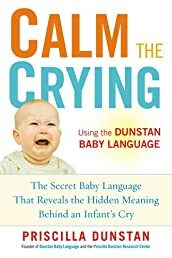 Thirteen years of research culminated in the Dunstan Baby Language, now made available to all caregivers in Calm the Crying. Helping readers learn to recognize and respond to exactly what their baby needs, Dunstan’s remarkable program covers ten sounds in total that can be identified and used to calm a baby. Brimming with diagrams and photographs, Calm the Crying reduces the frustration of wasted time spent addressing the wrong needs. A baby’s cries are a powerful form of communication—now made even more powerful because the message can be understood loud and clear.